WESTLIFE star Nicky Byrne yesterday spoke of his sorrow at the death of Wales football player and manager Gary Speed, with whom he trained at Leeds United when he was a schoolboy. “I’m stunned because I knew Gary when I was at Leeds. It was only last May myself and my wife Georgina sat next to Gary and his wife at Shay Given’s charity ball in Manchester,” he recalled. “There’s terrible shock that someone so young and healthy could be dead. He was a lovely fellow to me and to everyone else and I’ll be thinking of his family this Christmas,” said Nicky, who was a goalkeeper, and won the FA Youth Cup during his time at Leeds. Mr Speed was found dead at his mansion near Chester 10 days ago. But last night Nicky Byrne was putting his best foot forward as a solo attraction. He and his bandmates might have called time on their million-selling boyband but there were still hordes of screaming girls to greet the 33-year-old when he opened the new Lifestyle Sports flagship store on Dublin’s Mary Street. With hundreds of fans held back by barriers and a small army of security men, it was business as usual for the Malahide-based popstar, who revealed he was still “shell-shocked” by the band’s decision to call it a day last October. “There’s no point in denying it, we are all still simply devastated over the split. But after 13 years it was inevitable this was going to happen some day,” Mr Byrne told the Irish Independent. As ever the four members have turned to manager and creator Louis Walsh, who as well as his ‘X Factor’ duties, was offering career advice. “We’ve been meeting with Louis, collectively and individually. Who else could we turn to? After all he knows better than anyone else how to spin a story, and has contacts throughout the entertainment business which are coming in really useful now,” Mr Byrne said. The father of two has been relying on Mr Walsh’s network to plot his move into a new media career, but doesn’t have anything to announce yet. 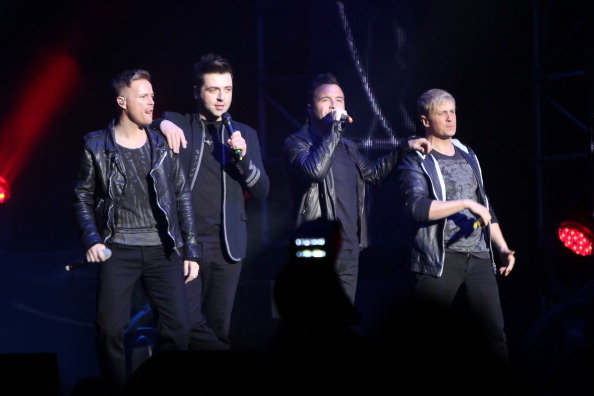 “It’s scary in ways because the security blanket of Westlife is gone. But at the same time, I don’t want to jump into anything so I’m exploring all my options, talking to broadcasters in TV and radio as well as talent agencies. The last few weeks have been about seeing what is out there for Nicky Byrne post-Westlife,” he said. But despite this new beginning, as the new year approaches Mr Byrne said his thoughts once again were of his late father, Nicky Byrne senior, who passed away in November 2009. With this in mind, he asked mystified manage-ment at the new Lifestyle Sports Flagship store he opened yesterday for a pair of trainers inscribed with the words ‘Nucal’. “I think the crew here thought it was a South African football team but it’s actually a little private joke with my dad. I remember one New Year’s Eve he came home really drunk. Being just 15, I said: ‘Dad you’re drunk.’ But he denied it, saying: ‘I could walk to Nucal and back.’ He meant Lucan, but he was so drunk, Nucal is what came out,” Mr Byrne said. With his diary now empty until April, when rehearsals begin for Westlife’s farewell tour, which includes three monster shows in Croke Park, Mr Byrne said he believed that throughout their career the band had made a lot of people happy. Last week the Irish Independent reported comments from rival Irish group, The Script, who said Westlife’s lack of original material could mean this will be the last anyone hears of them. Elsewhere in 2012, Westlife member Kian Egan will be seen on new RTE talent show ‘The Voice Of Ireland’ from January; lead singer Shane Filan is working on a solo career; and Mark Feehily will continue his work as a pop songwriter.